…you better do something with it. Like asparagus, rhubarb does not have long enough a season for one to ponder buying it another day—unlike potatoes, greens or onions, for example. But ask your market vendors. They usually know how much longer something will be available. One look at these ruby stalks and you think “Making a pie sounds like a lovely idea, doesn’t it?” And then the poor things go limp because your culinary intentions were just that, intentions. 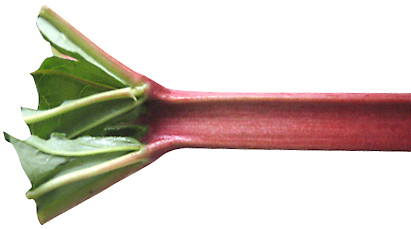 But I’ll say this about not only rhubarb: Just cook it while it’s available. Don’t wait for a special occasion or more time or the right mood. The doing of it inspires more of the same. This is true of just about anything. I say, forget the pie! You can download my Rosemary Rhubarb Galette recipe, which is like pie, only more wabi sabi, and therefore, more fun to make. Not to mention easier. 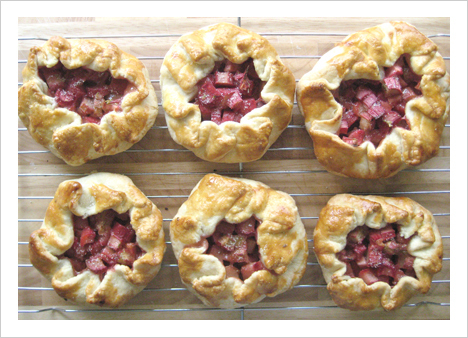 JeanAnn Van Krevelen of Portland Foodie wrote about her love affair with rhubarb as well as a few ideas on cooking with rhubarb. Splendid Table’s, Lynne Rossetto Kasper, offers a Rhubarbarita recipe for when a regular margarita just won’t do. Now I’ve got a quart of this syrupy garnet goodness in my freezer, ready for the next party. The easiest thing to do is chop it up and cook it with a little water and sugar (like you would for cranberry sauce), till the rhubarb is tender. Eat it with a pork chop or for breakfast with granola and yogurt. Couldn’t be easier. It freezes well, too. Just chop it up and put it in a freezer bag. It’ll keep for a year. Love the combination of rosemary and rhubarb, and these galettes are a must-try for spring. I wanna rhubarbarita! But that’d be impossible to say after even one. How ’bout just rhubarita? I’m sure the second one will go down as easy as the first. Galette recipe link. YAY! Thank you! Would I be demoted to a lower place in the food chain if I were to use prepared pastry dough?